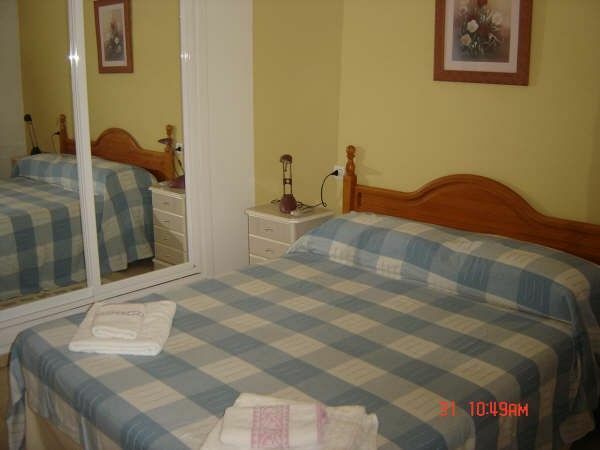 This apartment is perfectly located being close to the beach and the centre of Fuengirola. It has air conditioning (or heating) to the lounge/diner and main bedroom, a new kitchen with granite work top, Bosch oven and vitro ceramic hob and dishwasher. There is a separate laundry room. Both bathrooms are completely remodelled with new bathroom suite, modern lighting and tiling. The master bedroom is fully en suite. Other facilities include new furniture, cable TV with all main English channels and a CD player. There is a swimming pool and underground parking - although it is only a five minute walk to the bus and railway stations (for trains to Benalmádena, Torremolinos, Málaga airport and city centre). The current owners are involved in the hotel and accommodation industry for the past 22 years and have excellent experience in customer care. Fuengirola Centre: We have Norton live update anti virus for all e mails and information we send you. Your computer is safe. During the last year the town council have spent a lot of money improving the appearance of Fuengirola. They are particularly proud of the number of trees that have been planted and the work that has been done on the main square which is often used for public events especially during the fiestas of Spain. Restaurents, Bars & Nightclubs. : Fuengirola has a fabulous selection of Restaurants, Bars & Nightclubs. it is situated in a quiet location where there is no noise at night. Location is ideal for family and couples as it is a well matured and pleasant area. Golf: Close to the flats is a booking centre for Golf Courses and there are plenty within easy reach. Some of the finest golf courses on the Costa del Sol within in short distance to the apartment. If you wish to arrange your golf courses before your trip we can arrange this with a colleague of ours in Fuengirola which we can put you in touch with. Car hire, we can put you in touch with a reliable car hire company with keen rates. There is one small step to get into the building and then a lift to the third floor. The garden and the pool require the ability to negotiate some steps. We have just returned from a two week stay over Christmas and New Year. What a great apartment, in a brilliant location. The apartment was modern, cosy & literally home from home, it had everything you could possibly need to live extremely comfortably. The living/dining room was large with satellite tv with all the English channels & sports & movies, the bedrooms spacious, a safe & hairdryers provided, the bathrooms, both large, had a bath with shower over & a bidet. The kitchen & utility room were fully equipped, everything I wanted to use was there. The towel supply was plentiful with beach/pool towels also provided. The balcony, overlooking the pool, had sun all day with plenty of seating. The car park space was great in the garage underneath the apartment, however a car is not at all necessary, the train station is a 5 minute easy walk away & there are lots of shops, bars & restaurants right on the doorstep, with the centre of fuengirola old town (Constitución square) also only a 5 minute walk. The beach is just 1 minute away. The apartment is situated in a bustling area but is very quiet & peaceful at night. There was a lovely welcome pack waiting for us also. The owners & the team that look after you are great. We love fuengirola & this is definitely the perfect place to stay. We will be back as soon as we can! I have recently returned from our annual golf trip with 7 friends, (we also rented another apt in the same block). Martin was a pleasure to deal with and his agent (Lesley) could not have been more helpfull. The apartment was a real home away from home with every possible facility. The Apt is located in a quiet area but it is only a short walk to the many bars and restuarants. There are supermarkets located close by and we enjoyed excellent breakfasts at 'Plan B' just around the corner. The undergound parking was a real bonus. We will certainly be back next year. Myself and friends have stayed in this apartment several times in the past 2 years, both in the summer and winter. It is always our first choice to stay in. This apartment has a fantastic location as it close to both the beach and main restaurants/bars and shopping areas. However is is in a residential area so it is not noisy at night. There is a supermarket located right across from the entrance which is very handy. We usually get a taxi to the apartment from the airport which costs about 20e, however the train from the airport goes directly to Fuengirola and the apartment is only about a 5 minute walk. The apartment is furnished with everything you could need for your stay and the owner is very friendly and helpful. We are heading back in September and can't wait to stay in this great apartment again. This is a very spacious apartment with all mod cons. Ideally placed 5 min walk to the beach, shops, restaurants, and nightlife. Close to train and bus stations for easy access to other resorts. Beautiful pool area for those nice relaxing afternoons. The four of us had a great family holiday and would recommend it for anyone seeking a superb getaway. Also the owner very helpful at all times before and during our stay. The apartment was very comfortable with all modern appliances, very spacious with 2 bathrooms. The pool and gardens are well kept and the standard of hygiene is excellent. The apartment is centrally located minutes from the beach and close to ''Fish Alley'' where there are lots of wonderful restaurants & bars. A visit to the town square is a must to have coffee and to see the wonder range of shopping. Our overall stay at the accommodation was excellent and real value for money. we are hoping to return again this summer. A really lovely apartment in an excellent location. There were 5 of us in our party of differing ages and the apartment suited us all. There was everything we needed in the apartment including up to date magazines! The air conditioning was appreciated as it was very hot. The garden and pool area was lovely and clean. The owner was extremely helpful beforehand and we were met by a very helpful pleasant lady who was available throughout the week if we needed. We caught the trainboth to and from the airport and this was very efficient and cheap! The apartment was easily within walking distance from the station. We would certainly think about coming back again! Fuengirola is a great location for family and small group holidays. The beach is only 50meters away. Town centre is 2/3 minutes walk. A huge variety of restaurants, bars and shops, all within a short distance of the apartment. Most of these places can be found around fisher's alley. Plenty of golf courses within 15minutes drive from the apartment. Malaga approx 30minutes on the train, train and bus station are within 5mins walk. The apartment is family owned which we use often. The apartment has all the required needs for groups of 6/7 people and for small groups. We have a restriction on groups of under 25 unless with parents. This is a residential area and we respect the residents.